The system menu bar in OS X is usually fully accessible, either by moving your mouse to the top of the screen and clicking on it or by using hotkeys. However, there may be times when that menu bar stops working: It may disappear or stop functioning, items on it may be grayed out or frozen, or your cursor may show the spinning beach-ball when you hover your cursor over a menu bar item. Here's how to troubleshoot the problem when any of those things happen. Whatever the specific problem, the first thing to do is to check whether the frozen menu is the result of a third-party add-on, such as Dropbox, LittleSnitch, Evernote, or the like. You can determine this by hovering your mouse over each menu item for a few seconds. If only one item produces the spinning color wheel when accessed in this manner, and the others are still functional, you’ve isolated the problem. You can further check this by opening Activity Monitor to see if any hanging processes (highlighted in red text) correspond to the frozen menu item. If you determine the problem is from a single third-party app, then you will have to troubleshoot it. Sometimes quitting or force-quitting the app will be enough to fix the problem. It's also worth checking to see if an updated version is available. However, if those steps fail to clear the problem, then you will have to dive further into the specific app’s configuration. This may involve removing preference files and caches, or adjusting system settings that might conflict with the application; the specific steps will depend on the app and the services it offers. Your best bet in these situations is to contact the app’s developers and official support channels to troubleshoot the problem. Built-in status menus (blue) are managed by the SystemUIServer process, whereas third-party menus (red) run independently. Because third-party apps like Dropbox or iStatMenus are separate programs, they tend to hang independently. By contrast, Apple’s status menus (such as the Wi-Fi, Volume, VPN, BlueTooth, Battery, and System Clock) are managed by a central OS X process (SystemUIServer), so they might all freeze at once. So if you notice that one or more of these items is producing that spinning color wheel, you can often solve the problem by killing that process. To do so, open the Activity Monitor utility, choose All Processes from the View menu, and then select the SystemUIServer process and click the Force Quit button on the toolbar. Alternatively, you could open the Terminal, enter the command killall SystemUIServer, and press Return. 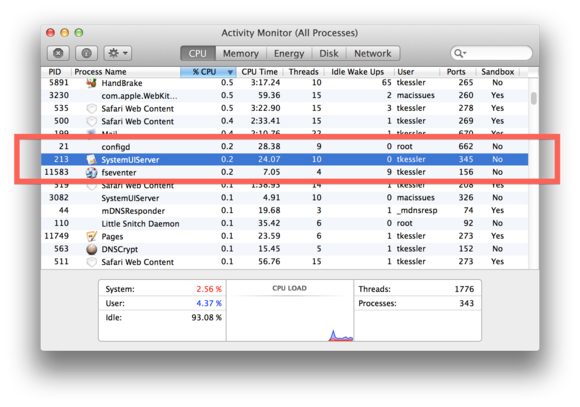 Search for the SystemUIServer process and then click the toolbar button to force-quit it. The process should automatically restart and load your menus again. If neither of these solutions works, then it may be that that the menu bar itself is on the fritz. If your system menu bar is hanging, not present, or otherwise inaccessible, then there are several ways to go about fixing the problem. Toggle full-screen views: In most applications that support full-screen, pressing Control-Command-F should activate this view. Toggling this setting can spur the menu bar to reappear if a small bug has temporarily hidden it. If the frontmost program uses an unconventional approach to running full-screen, then go to its settings to toggle full-screen view. Change or quit the foremost application: Try changing the foremost application by quitting it or using Command-Tab to switch applications. Doing this should spur the menu bar to change, causing the system to re-draw it and perhaps making it full and functional again. If the application is hung up, then try force-quitting it either using the force-quit window (Option-Command-Escape), or right-clicking its Dock icon and holding down the Option key to reveal the force-quit option. Restart your system by using the Apple menu, or by holding the power button (for three seconds in Mavericks) to bring up the power menu, where you can choose the option to restart. If the system will not restart, then force-quit applications using Option-Command-Escape, and finally hold the power button to hard-reset the system if nothing else works. Reboot into Safe Mode by holding the Shift key immediately when hearing the boot chimes at startup, which will run some basic maintenance tasks. Then reboot normally. Check the boot drive for errors with Disk Utility, and if found then reboot into Recovery mode by holding Command-R at startup. In addition, consider using a third-party drive utility to test the drive for bad blocks, since these can easily result in a system or application hang. Reset your system’s PRAM and SMC. The approaches above should clear a frozen or hidden menu bar. However, if those problems return, you can try several things to help prevent them from happening in the future. First, check your third-party menu extras (system monitors, security software, etc.) and update or remove them if you rarely use them. Even though these may not be managed by the SystemUIServer, they could still hang or spur a hang in the status menus. Next, try removing the SystemUIServer preferences file, which is the configuration for which menu extras you have enabled. First press Shift-Command-3 to take a screenshot of your display (including the menu bar) as a reference, and then select Library from the Go menu (hold the Option key to reveal the Library item in this menu). 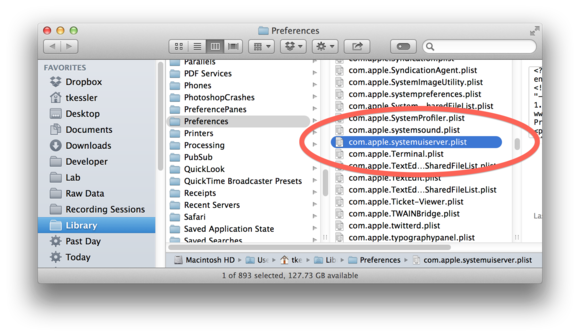 Then go to the Preferences folder, remove the file com.apple.systemuiserver.plist, and log out and back into your account. When this is done, you will have to re-populate the menu extras you use via System Preferences and the appropriate system utilities—but you have that screenshot you took as a reference.